I Used Quikclot on My Dog which I Carry in My Dog First Aid Kit. I was recently hiking in the Southern Arizona mountains with my dog, Mocha. We were quite a long way from the trail head and there were no other people around, so I took Mocha off his lead. We rounded a bend in the trail and a Javelina was directly in our path and my dog went right after it. 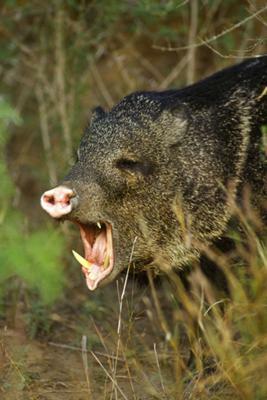 A Javelina is a type of wild boar. They are big, tough and have tusks. The Javelina and Mocha were in a fearsome melee and I waded in with my hiking stick to hit the Javelina and, after a bunch of pokes and whacks, it took off and I was able to grab Mocha. He was cut in a couple of places and was bleeding heavily and I took my First Aid Kit from my backpack and tried to get him bandaged, but he was bleeding too badly from one of the cuts. I carry Quikclot gauze pads in my kit and I opened one of the packages and pressed the gauze pad into the wound. The bleeding stopped, just as it would if used on a human. Quikclot is a type of medical gauze that is impregnated with kaolin, a substance that causes the blood to clot. It has been used by our military in Iraq and Afghanistan and it has saved many lives by preventing the wounded person from bleeding out. I bought some for my kit on the advice of a Paramedic who had used it when he was in the service. I had no idea that it would work on a dog but was relieved that it did. I took a look at the website of the manufacturer, Z-Medica corp. and found they sell a product called "Petclot", which I believe is a formulation designed for pets, but I do not know how it is different from the "Quikclot Sport" that I carry. All I do know is that I was able to care for Mocha. It was a relief to be able to treat him and he has fully recovered. We will be hiking together this weekend! Comments for I Used Quikclot on My Dog which I Carry in My Dog First Aid Kit. Hey guys make sure if u are going to use Quikclot that u do so correctly. The correct way is not to press the entire pad against the wound. The correct use is to spread out the bandaging and just like you would stuff rope into a bag one section at a time you stuff one section of bandaging at a time into the wound and pack the wound. It's the wicking action that makes the Quikclot most effective. One you start applying the Quikclot you never remove it. When you are done packing the wound you take cling or coban and wrap it. Keep the wound wrapped and only a veterinarian should remove it (so you don't prematurely break up the clotting action). After reading this I must have Quikclot. I had never heard of it before but I need to add it to my first aid kit.